We are proud to announce the recent launch of ATLAS.ti Mobile for the iPad. It is is the ultimate interviewers' field recorder and coder and a perfect companion on the road. Download the new ATLAS.ti Mobile for the iPad app for FREE from the App Store. Get the full information here. We also announce that the release of a full native MacOS version of ATLAS.ti is on schedule for 2014. Read what to expect. The 2013 ATLAS.ti User Conference in Berlin is shaping up to become a great success! Close to fifty presenters from eighteen countries will share their insights and experiences with you. Find a list of scheduled presentations and learn how to register here. We congratulate the winners of the 2012 ATLAS.ti IIQM Dissertation Awards, s ponsored by ATLAS.ti and IIQM. Read more. Training opportunities: There is always more to learn. Read a full overview of the wide-ranging activities of the ATLAS.ti the Training and Cooperation Center. More here. Great Summer Specials: Until July 31, receive a 20% discount on all new Single User licenses (including student and semester licenses) and courses. Also, buy Susanne Friese's seminal book at a full 30% discount. Read more. Free iPad App: ATLAS.ti Mobile for the iPad Now Released! ATLAS.ti has recently received a highly effective and mobile companion--ATLAS.ti Mobile for the iPad. Using this free app you can collect and analyze data wherever you are. Work on text, audio, video and images. Analyze existing data files or create recordings on location. Working in the field or on the go has never been easier! ATLAS.ti Mobile for the iPad is the perfect interview tool: Simply record the interview (audio or video) on location, and start segmenting and coding on the way home. Write down your thoughts and ideas in comments and memos. Then simply transfer your project to the desktop version of ATLAS.ti for full leverage of its analysis tools, visualization, and team collaboration. At work, at home, or anywhere in between: ATLAS.ti Mobile keeps you moving right along! ATLAS.ti Mobile utilizes all the same concepts that you know from your ATLAS.ti desktop application: Primary documents, quotations, codes and memos. Supported file formats are: Text, PDF, images, audio and video files. Go to http://ipad.atlasti.com for additional information. You'll find am overview of its functionality, the official manual for download, and a way to contact our support. Since ATLAS.ti Mobile for the iPad is brand new, we are eager to hear about your experience and your opinion of this new tool. Contact us at [email protected] with your comments. Or visit us on facebook at facebook.atlasti.com. Your praise, criticism, and suggestions are highly welcome! ATLAS.ti Mobile for the iPad is available FREE OF CHARGE from the Apple App Store. ATLAS.ti Is Coming to the Mac! We have listened to the many requests made by our users and have great news for all you Mac users out there: ATLAS.ti is coming to the Mac! Written as a native Mac app from the ground up, ATLAS.ti for the Mac will bring you the power and flexibility of our leading QDA software without the need to run Windows. Easily collaborate with colleagues using PCs and import projects from ATLAS.ti 7 as well as from the new ATLAS.ti iPad app. Work in any language, with full Unicode support. ATLAS.ti will bring our best-of-breed PDF support, slick and powerful video annotation tools, rich text editing, and much, much more to the Mac. All in a beautiful and easy-to-use app leveraging the power of OS X. Speed - Stability - Security: No emulators, no virtual machines, no vulnerable Java! Expected release date of ATLAS.ti for MacOS will be in mid-2014. For all ATLAS.ti 7 license holders, switching will be FREE! The ATLAS.ti User Conference 2013 - Fostering Dialog on Qualitative Methods, happening from Sept. 12-14 in Berlin, is shaping up to be a truly globe-spanning event. We will be proud to welcome nearly fifty contributors from eighteen countries (Europe, North America, South America, Africa and Asia) to Berlin, and extend our invitation to all interested users, practitioners, researchers, teachers, and students who use ATLAS.ti centrally in their work. Please find an overview of all papers, posters, roundtables and workshops below. For all those who are not able to attend, we will publish digital conference proceedings with full length papers. In addition, we will video record selected sessions and make them available online after the conference. The first day of the conference ends with a conference dinner and a party on the roof-top of the conference venue where you can meet, chat, exchange ideas, network, and just have a bit of fun. For the end of the second day, we have planned a semi-serious/semi-entertaining Pecha Kucha session: Pecha Kucha is a special form of presentation in which presenters have 6 minutes and 40 seconds to present their ideas on 20 slides. The slides advance automatically, thus there is no danger of going over your time—you have 20 seconds per slide and then must move on. Three presentations are already in place. If you would like to try it and have an interesting idea, please let us know via [email protected] . The best presentation will be awarded with a prize! Imagine, you could return home the winner of the first-ever ATLAS.ti Pecha Kucha event :-). Conference registration is available online at http://conference.atlasti.com/index.php/conference-registration. Discounted early registration fees apply until August 1. For all those whose who live in or near Berlin and who want to drop by for just a few presentations, a workshop, or for networking with other ATLAS.ti users, we offer day passes. Teaching the fundamental differences and relationships between analytic strategies and analytic tactics allows the gap between them to be bridged, and for ATLAS.ti to be used powerfully in any project. It is challenging to teach students to use ATLAS.ti powerfully. The underlying reason is that the nature of QDA is fundamentally different from the nature of software. The tasks of a QDA are not pre-determined, but unpredictably iterative and emergent. Software, no matter how artful the user interface, is fundamentally deterministic: every function has a certain, predetermined outcome. This gap has to be intentionally bridged, or the software is used superficially: used only for the early stages of analysis, or only for those kinds of analysis that are so structured that the contrast between the nature of QDA and the nature of software is small. One way to manage this challenge is to teach the fundamental differences and relationships between analytic strategies and analytic tactics, and how to bridge the gap between them. This allows ATLAS.ti to be harnessed powerfully from the beginning to the end of any kind of QDA. The contrast between analytic strategies and analytic tactics is proportional to how unstructured is the QDA, regardless of the research method. The more unstructured the QDA, the more there is a need for this perspective, and the greatest is the potential for ATLAS.ti to make a significant contribution. We are happy to congratulate Carrie Mitchell and Holly McKenzie who have won the 2012 ATLAS.ti IIQM Dissertation Awards (at the PhD and the Masters level, respectively). Sponsored by ATLAS.ti and IIQM, this award is annually presented to the best Masters level thesis and the best PhD level dissertation, from any academic discipline, containing research based on qualitative methodology. Both winners receive $ 3,000 in cash and an ATLAS.ti software license. Her thesis is entitled: A narrative inquiry of women’s lives in Mugu, Nepal: identities, power relations and education . Mitchell's study questions assumptions around universal understandings of gender and education. Using a narrative inquiry approach it focuses on the life -narratives of five women from the remote Himalayan district of Mugu, Nepal. It aims to examine the complexities of lived experience by gaining insight into how understandings of education are embedded in women’s multiple and uniquely intersecting identities, and in doing so, it challenges singular definitions of gender and education. Influenced by po stcolonial feminist theory, this inquiry applies an intersectional analysis to consider how identities (including gender, ethnicity, caste, position in the family, role in the household, age and economic status) interlock to create unequal power relations, and how the meanings and values that the women attach to education are embedded in these relations. As a narrative analysis this study foregrounds the five women’s voices and experiences, challenging assumptions about whose experiences are valued and whose voice can be heard. Other voices have been interwoven with the women’s stories and presented as a multi-layered narrative; these include the local expressive tradition of ‘deuda’ singing, interviews with educational stakeholders, and reflexive journaling. In keeping with narrative inquiry approaches, I use a more personal voice to reflect on concerns about power dynamics and ethical challenges involved in the research process. Issues of representation, as well as struggles relating to voice and positionality, are at the core of the study and reflexively considered throughout. By using a narrative inquiry approach; taking a postcolonial feminist perspective; and applying an intersectional analysis, this study refuses to rely on essentialist and homogenising constructions of women. It attempts to be an example of ethical and respectful research and claims to increase understanding of how identities, power relations and education intersect in women’s lives in Mugu, Nepal. Her thesis is enttitled: The Different Stories of Cree Woman, Daleen Kay Bosse (Muskego), and Dakota-Sioux Woman, Amber Tara-Lynn Redman, Understanding their Disappearances and Murders Through Media Re-Presentations and Family Members Narratives. Mc Kenzie's dissertation explores Pauline and Gwenda’s stories about their daughters and their families’ experiences, Aboriginal and mainstream media coverage, and the discursive practices underlying media coverage. Bringing together these methodologies made the tensions between Aboriginal communities’ stories and mainstream institutional stories (and the ontologies that inform them) visible. Recognizing how Aboriginal family members’ stories are often marginalized, she utilized Indigenous Storytelling Methodology to center Gwenda and Pauline’s stories. Further, she used FPDA to address how print and broadcast coverage (and the discursive structures that shape coverage) reproduces and resists the discourses operating within white masculine hegemony. ATLAS.ti has a learning system constituted of two sets of services and products, both of which complement and support each other. At the center of the learning system is what I would call the “primary learning sources,” made up of free webinars, video archives and tutorials, premium trainings, and written manuals. Supporting these services and products are the “secondary learning sources”, configured by the Knowledge Base on the ATLAS.ti website, the newsletter which periodically publishes useful articles on functions and best practices, the forum, and the ATLAS.ti Facebook page where users regularly exchange insights and ask and answer questions. Product Support services (support.atlasti.com), all of which are free of charge to ATLAS.ti users, are not included in this model because rather than constituting a source of systematic learning, these services are aimed at solving specific problems that users may encounter when using the software. However, from a larger perspective, it is legitimate to consider Product Support as a complement of the ATLAS.ti learning system. The figure below depicts this system. Following, I will describe the primary and secondary learning sources that make up our learning system. 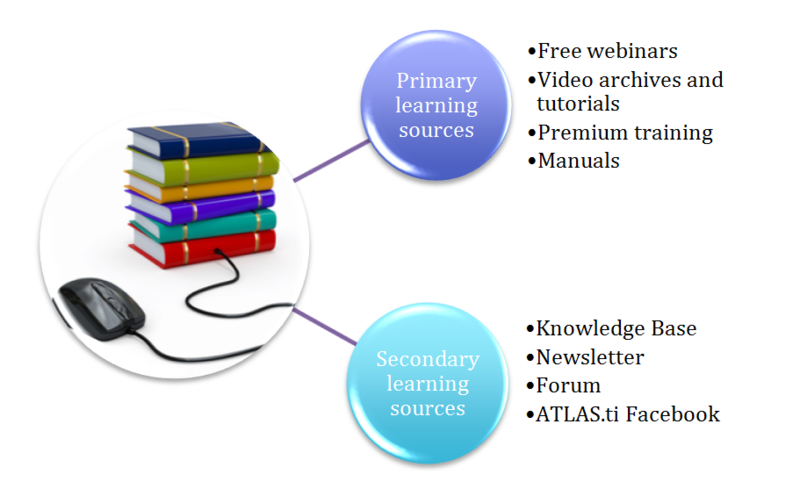 Primary learning sources consist of different training services and products that allow newcomers to learn ATLAS.ti systematically and experienced users to further specialize in specific areas of the analysis process with the program. This system consists of free webinars, video archives, premium trainings, and written manuals. The diagram below shows an integrated view of these learning sources. 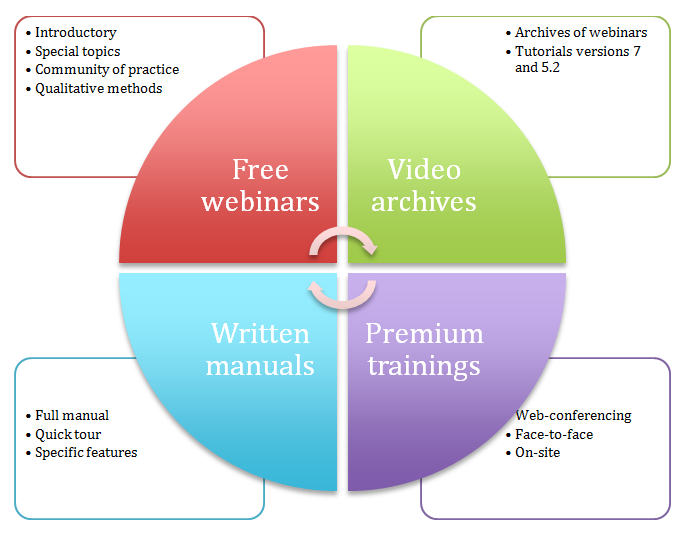 We offer four different types of free webinars: introductory, special topics, community of practice, and colloquia on qualitative methods. You can register for them at www.atlasti.com/webinars.html. Each of these categories is described below. These are one-hour webinars that provide an overview of ATLAS.ti and teach how to create a project, code, and produce basic outputs and reports. These webinars are scheduled regularly every week in the English language, at 12:00 pm New York time/5:00 pm London time. Additionally, we teach, twice a month, an introductory webinar in the Spanish language, at 15:00 CLT (Santiago de Chile time). We will be scheduling soon a series of introductory webinars, also in the English language, but at a time convenient to those of you from Asia/Pacific time zones. These are one-hour webinars in which the instructor discusses specific functions and applications of ATLAS.ti. This semester we will be offering webinars on the following topics: analysis tools, approaches to coding, family organization, geo-coding, memos, multimedia coding, networks, surveys, and teamwork. Although not an absolute requirement, basic knowledge of ATLAS.ti is beneficial in order to take the most possible advantage of these webinars. I would particularly encourage those of you wanting to work in teams to attend the corresponding webinar before venturing on your own into the intricacies of teamwork. 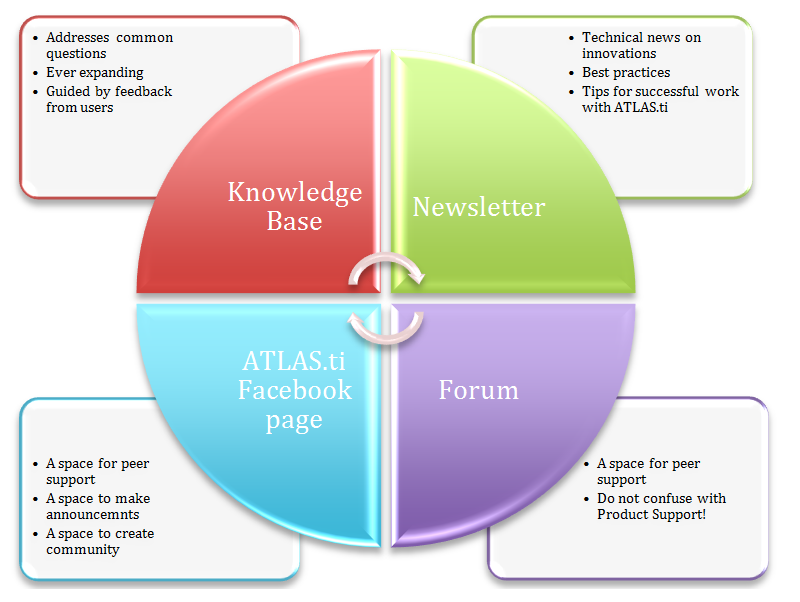 Our objective with this program is to promote peer learning in the ATLAS.ti community of users. Once a month, researchers will share the strategies and approaches they have followed, the challenges they have faced, and their accomplishments using ATLAS.ti in their analysis projects. Researchers from multiple disciplines will be invited to present their work in one-hour webinar sessions (30 minutes of presentation plus 30 minutes of dialogue). Presentations will be in the English and Spanish languages. Our intention is that the ATLAS.ti Community of Practice will eventually become a permanent virtual congress of ATLAS.ti and its role in the research process. If you would like to join the program as a presenter, please contact us. We would be happy to hear from you! This is a virtual colloquia series on qualitative methods co-sponsored by ATLAS.ti and the International Institute for Qualitative Methodology (IIQM). Participating scholars have included specialists in computer-assisted qualitative data analysis, hermeneutics, interpretative writing, ethnography, applied health research, and media ethnography. To learn more about this webinar series, visit the program website at http://www.iiqm.ualberta.ca/en/ResearchTraining/WebinarSeries.aspx. Although these webinars do not teach ATLAS.ti, I do include them as one of the primary learning sources because they provide the necessary methodological context within which ATLAS.ti is used. The Premium Training program includes online, face-to-face, and on-site courses. Following is a description of these training opportunities. In these courses we teach ATLAS.ti in a systematic way. We are now offering introductory and advanced workshops in the English, Spanish, and German languages. The introductory courses in the English language are regularly taught bi-monthly at 12:00 pm New York time/4:00 pm London time. Starting in October, we will be offering an introductory course also in the English language at 9:00 am London time/4:00 pm Singapore time. We also teach introductory courses in the Spanish language at 3:00 pm Santiago de Chile time. Our advanced courses are taught at 11:00 am New York/3:00 pm London. We offer on-site workshops that can be contracted by institutions from anywhere in the world. In these workshops, one of our instructors will plan with you a course program that fits the needs of your group. These workshops are taught in two days of intensive work. If you are interested in contracting one of these courses, write or call us. If you are a student and would like to apply for a scholarship that would allow you to take the web-conferencing and face-to-face courses either for free or at a discounted price, please do so by completing the Student Scholarship application form: http://www.emailmeform.com/builder/form/Caz82b0gIE6aaLMX. Finally, we have a set of written materials that supports the learning process, which can be accessed at manual.atlasti.com. These are the full manuals for versions 7 and 6, the Quick Tour (also for versions 7 and 6), and a set of short documents that describe specific features of ATLAS.ti. I would also like to add that specific chapters from the full manual may be downloaded from the ATLAS.ti Training Center weblog at http://atlastitrainingcenter.com/resources/manual/. The secondary learning sources are those that do not play an essential role in the ATLAS.ti learning process. However, they are certainly important as a complement to the webinars, videos, courses, and manuals, allowing users to address specific questions that come up in the normal process of working with ATLAS.ti. The figure below summarizes this system of secondary learning sources. 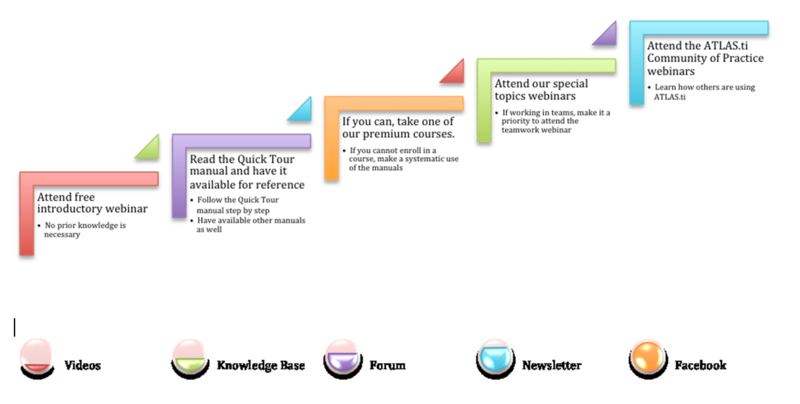 The Knowledge Base is equivalent to the Questions & Answers (Q&A) section in other websites. It is found under Support in our website (http://www.atlasti.com/knowledgebase.html). There you will find short entries explaining specific issues that users have identified as particularly relevant or difficult to understand. For instance, you will find entries explaining why it is not recommended to use online cloud storage systems to host the project data and/or ATLAS.ti libraries, entries on video formats that are accepted by ATLAS.ti, an entry explaining backing up procedures, among many more. It is essential to realize that the Knowledge Base is ever expanding as ATLAS.ti expands and evolves. Thus, I encourage users to send us questions and issues that you think should be addressed in this section of the website. As always, your feedback is very important to us. In “INSIDE ATLAS.ti,” the regular newsletter, you will find articles introducing and describing innovations and improvements, such as the article introducing ATLAS.ti 7 (issue 2012/1) or the article introducing the iPad app in the current issue. You will also find articles that describe and explain best practices with ATLAS.ti, such as the one published in the issue 2012/3 which explains the process of importing transcripts transcribed in f4/f5 and Transana. Finally, the Newsletter also includes articles from researchers who explain how they have used ATLAS.ti in their research projects, or share their methodological insights. The forum consists of four sections: general questions and comments, suggestions for innovation and improvements, a section on XML, and an archive of posts from 1999 through 2004. It also includes a section on qualitative data analysis. I encourage users to engage in dialogue with other users, offering your insight whenever you think that you can contribute to other people’s learning. Finally, the ATLAS.ti Facebook page is the space where the community of ATLAS.ti users gathers to learn about what is going on. There you will find announcements about updates, innovations, and trainings, as well as questions and answers from users. Some recent questions posted by users have been about using ATLAS.ti with Windows 8, running it in a Mac, linking codes in networks, the use of comments versus memos, etc. Finally, in case of doubt, do not hesitate to write or call us. I will be able to answer your questions about trainings. For other questions, always contact Product Support at [email protected] Thank you! We regularly hold free webinars for anyone who wants to get a head start with understanding the concepts and functions of ATLAS.ti. All events in English unless otherwise noted. The ATLAS.ti Community of Practice is a space where researchers share with other researchers strategies and best practices about the integration of ATLAS.ti into their data analysis projects. Participate in the community of practice and learn from colleagues from all over the world. The Qualitative Methods Master Class Webinar Series is a program jointly sponsored by ATLAS.ti and the International Institute for Qualitative Methodology. Note: No ATLAS.ti license is required to take part in a free webinar. However, you may get the most out of it if you at least have the free trial version installed. In our seminars, you learn to design and implement an effective analysis process with ATLAS.ti. Through a combination of lecturing and hands-on work with your own data you will explore the main functions of the software. Emphasis is put on data integration, organization, and constant documentation of the analytical process. Participants have the opportunity to discuss with peers and the instructor the methodological challenges of their own projects. Madrid / Spain - October 24 and 25, 2013 (9:00am each day). 12 hours. Location: Ibercenter Azca. Plaza de Carlos Trías Bertrán, 28020 Madrid (inmueble de Holiday Inn). Instructor: Neringa Kalpokaite. We regularly exhibit at prestigious research conferences throughout the world. This year, we will be present at several events in the United States, Canada, and Europe, in which our staff will be exhibiting ATLAS.ti and providing introductory instruction to those wishing to learn about the quality and advantages of our software. September 12-14: ATLAS.ti User Conference. Berlin, Germany. Now available at a 30% discount! Qualitative Data Analysis with ATLAS.ti by Susanne Friese is the very first book designed to guide you step-by-step through your research project using ATLAS.ti. In the book, you will find clear, practical advice on preparing your data, setting up a new project in ATLAS.ti, developing a coding system, asking questions, finding answers and preparing your results. Susanne Friese teaches at various PhD schools, provides training and consultancy for ATLAS.ti at the intersection between developers and users. As a seasoned qualitative researcher and avid user of ATLAS.ti for more than 10 years, I found Susanne's text way over-due! It provides beginners with step-by-step instructions on how to use the software. More experienced users may find her insights on how to maximise the various tools and new offerings of ATLAS.ti quite refreshing. Teachers will also benefit from the improved lay-out, to induct students into computer-assisted qualitative data analysis. A definite must-have for all doctoral students using qualitative methodology! This the kind of book on ATLAS.ti that we have been waiting for as qualitative reseachers and for our post graduate students in qualitative methods. Friese has produced a text that is both broad ranging in explaining and describing the capacity of ATLAS.ti software to analyse different types of text and visual data, and at the same time she provides thorough and clear detailed instructions and ideas in terms of the analytic processes (from file format, transcription, coding, managing and interpreting outputs). I will be recommending this for all my post graduate students and fellow researchers at all levels of experience in qualitative methods. I would like to express my gratitude for your great effort to bring CAQDAS, and ATLAS.ti in particular, closer to myself and my students with your excellent publication "Qualitative Data Analysis with ATLAS.ti", and the enormous volume of instructional and guiding materials, videos, powerpoint presentations, examples of interviews, audios. I have no place to even begin of how grateful I am as a researcher but also as a professor...A great thank you. Qualitative Data Analysis with ATLAS.ti has been written by an author with strong practical experience in the use and teaching of ATLAS.ti, and this shows in the depth and practicality of her treatment of this data analysis software... Targeting both undergraduates and postgraduates, Friese has designed the book in a novice-to-expert manner in eight chapters... Overall this is a thorough, accessible guide to an important qualitative data analysis tool that has become more popular in recent years. It is well suited to an audience of both undergraduate and postgraduate students.